It was like I had walked onto a movie set. Beautiful, honey-coloured stone buildings lined the narrow street that dipped down towards a slow-moving river. The sun had not yet warmed up and there was a nip to the morning air.The village slept as I sat on the bridge, legs dangling above the water. 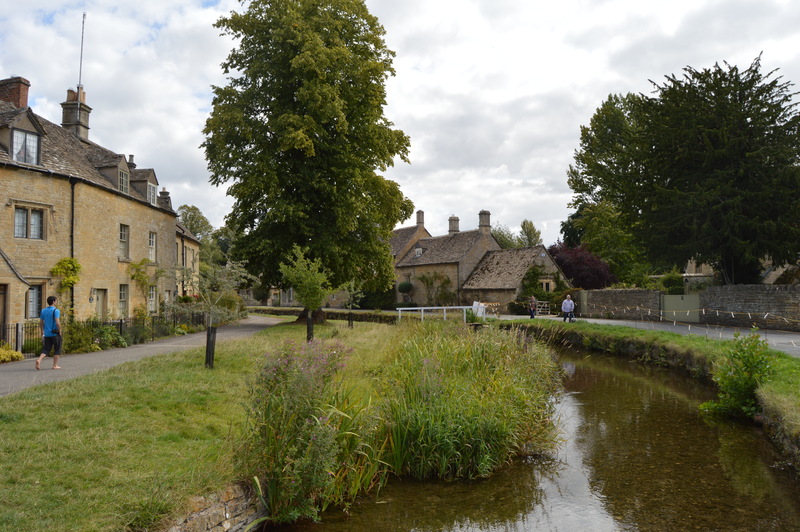 Upper Slaughter may not be the most attractive name for a village, but don’t be fooled by the name. It is one of the most picturesque villages I’ve ever had the pleasure of visiting. It is a village that stands still in time, a time before characterless bungalows and unsightly buildings made of cheap materials dominated our landscape. 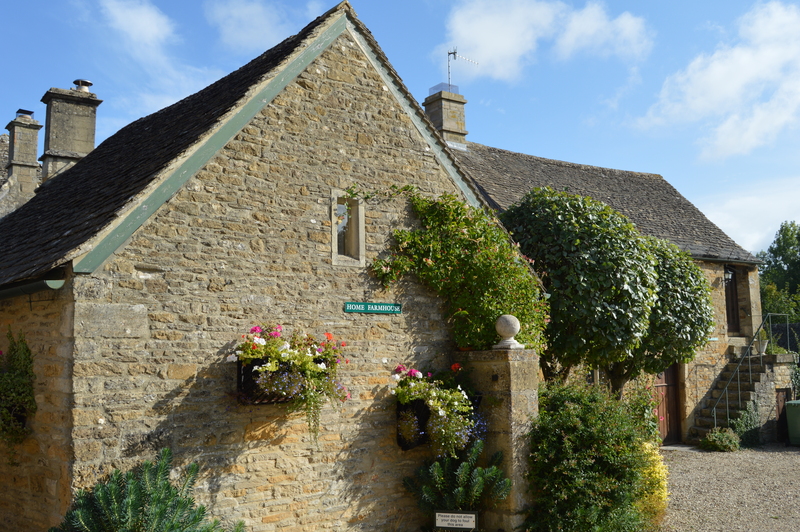 Here, the buildings are all made from traditional Cotswold stone, grass verges are neatly trimmed, flowers billow from hanging baskets and the sound of the River Eye is the only sound on a summer’s morning. I opened my eyes to find a man and woman standing over me smiling. Their dog pulled impatiently on its lead. I always find it amusing how in cities we race past one another, careful not to make eye contact, yet out in the countryside people are more open to chatting with strangers. It’s one of the reasons I love the countryside. It turned out the man had been born in the village, a time when it had been inhabited by shepherds, farm hands and the farmers themselves. Back then, there had been a shop and post office, a cobblers and a school, but today, the village lacks the luxury of any such facilities. It comprises mostly of weekend homes of the rich living in London and holiday lets. Despite being told the community had dispersed, by the time I heard the church bell sound 9 bongs, locals emerged from behind their wooden doors and were happy to reminisce about days gone by. At the heart of the village is the luxurious Lords of the Manor Hotel (Read full post here). The golden building is surrounded by acres of bright flower beds, lawn and bog gardens, overlooking rolling hills dotted with grazing sheep. 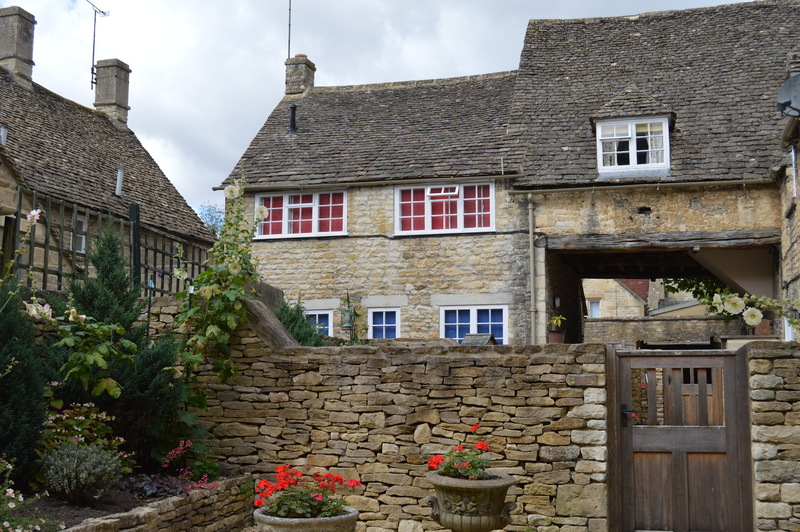 I had been lucky enough to spend my first night in The Cotswolds here and was reluctant to leave. However, there was one thing that softened the blow. My trip around The Cotswolds was to have a twist. I was to explore the villages and towns of the region in a vintage car. Lords of The Manor & The CAR! I will make my confession now. I don’t know anything about cars. I know they move from A to B. They are either comfy or they’re not. That’s about it. However, I do know when a car is special and as I walked up to the1963 two tone Austin Healey 3000, I knew I’d chosen the right car. I’d picked it up just 20 minutes from Birmingham airport from a company called The Open Road, where owner Tony Merrygold rents out a number of vintage cars for couples to whizz around the area in style. It’s a novel and fun idea, adding a whole other element to the weekend. If I had a euro for every conversation I had during my stay about the car with strangers, I’d be a wealthy woman. “My clients are mainly women. They tend to book the cars as a surprise for their husbands. For a couple of days they can believe it’s their car. It’s a gift many men would love,” Tony explained. It’s true, if Dan were into vintage cars, surprising him with his dream car for two days during a holiday would be the best gift ever. But this weekend, it was all for me. 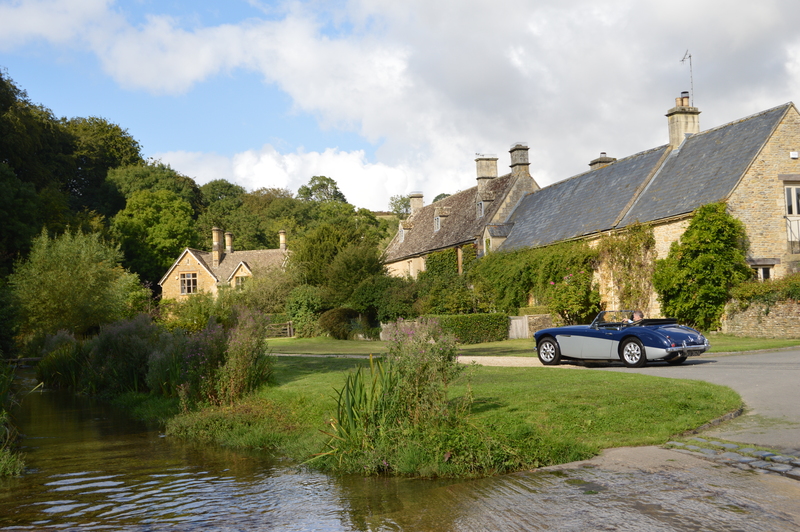 Roof down, wind in my air I zipped out of Upper Slaughter moving towards the neighbouring village Lower Slaughter. 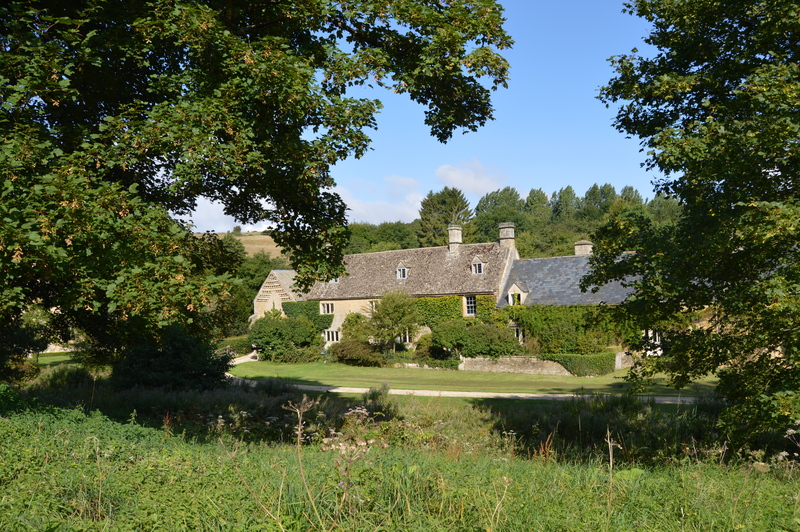 I hadn’t wanted to leave the friendly villagers and tranquility of Upper Slaughter, doubting that any town could be as beautiful, but its neighbour was just as beautiful. 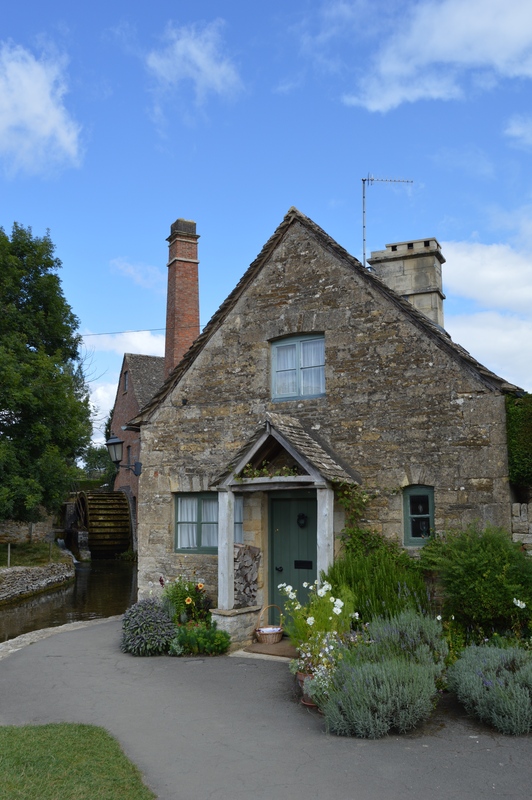 The River Eye also passes through the village and stone footbridges allow visitors to cross the river to get to the 19th-Century Watermill. The Old Mill is tucked behind a pretty row of stone cottages and has been transformed into a museum and craft shop with a tea room attached. As you step into the museum, jazz music plays gently in the background and you’re swept back to another era. Antique items are displayed casually and the museum tells the history of bread making and the workings of the mill. You can sit beneath umbrellas by the river where ducks paddle alongside merrily as the watermill churns slowly. The thing about The Cotswolds is that each town is as beautiful as the next. The roadsides are littered with rustic farm shops and quaint tea rooms. 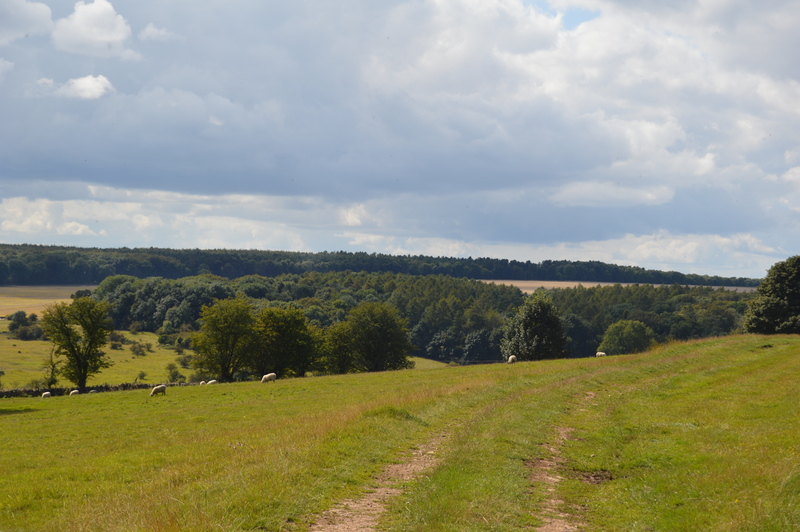 Sleepy, picturesque villages offer a haven to those seeking a quiet getaway and with hundreds of public bridleways in the area, you just have to walk to the edge of any village and a track will lead you into the hilly countryside. 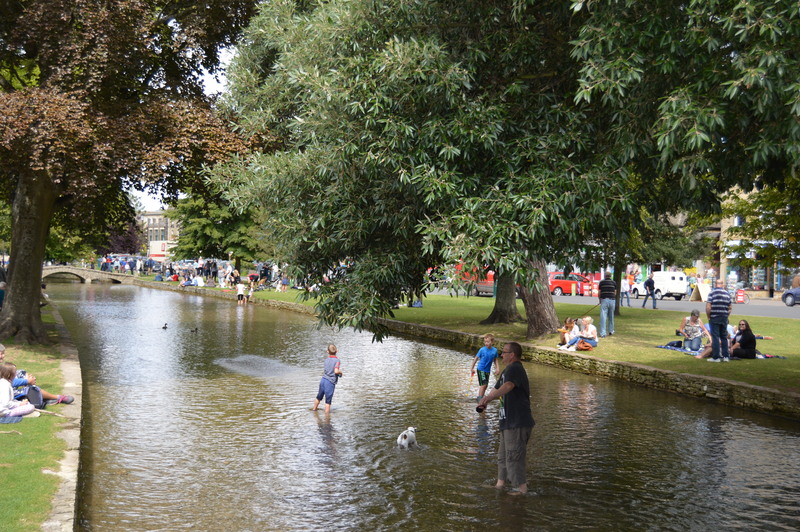 Busier towns include Bourton-on-the -Water known as the ‘Venice’ of the Cotswolds. 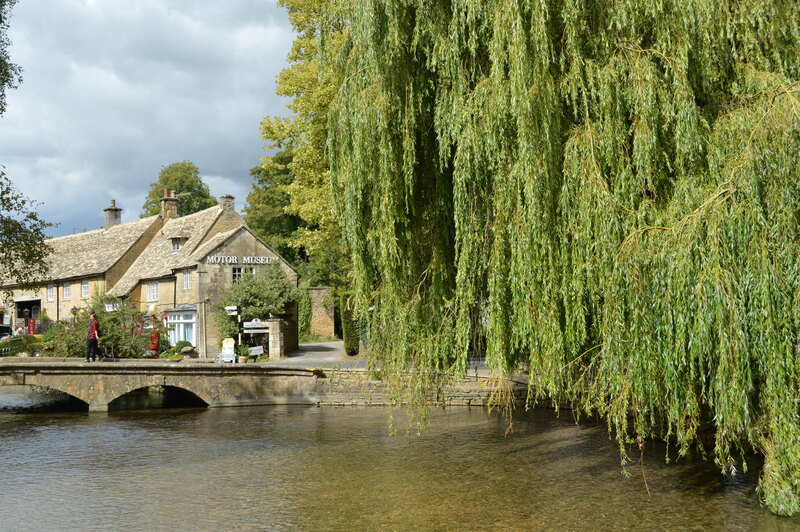 The town is built on the banks of the River Windrush, willow trees line the shore and stone bridges encourage visitors to cross between the two sides of the town. On a sunny day the banks are packed with couples and families lazing on blankets, children splashing at the edges of the river. Ducks stand by anticipating tasty snacks. Small boutiques, tea rooms and bars offer endless options to hungry travellers. Families are well catered for with things to do in the town; The Motor Museum and Toy Collection, Birdland Park and Gardens, or The Dragonfly Maze. Whatever your fancy, you won’t be disappointed. 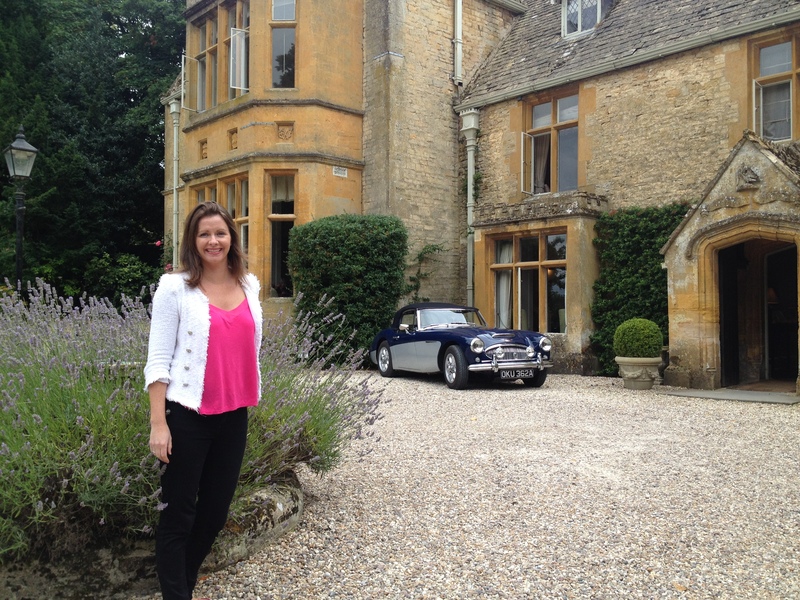 As I was in a vintage car, I had to explore the vintage side of the Cotswolds. They’ve developed Vintage Routes that lead you to secret vintage and retro shops dotted around the area. There is a taste for the old here and there is no shortage of antique shops where you can browse for hours. The beautiful town of Chipping Campden has a number of antique shops worth visiting, not to mention a fab cheese shop, while Vintage lovers should also make their way to Burford. The town has always been a bustling market town, and its 17th and 18th century buildings still stand proudly along the main street. Vintage to Vogue on the main street, is a real find if you’re in search of vintage clothes, jewellery, bags and shoes. Over 80% of The Cotswolds is agricultural – open fields, pockets of forest and rolling hills lure nature lovers in their droves. Walking trails link villages, some companies will even transport your bags so you don’t have to walk back the same way. It’s a magical way to explore an area and to spend a holiday. The more experienced hiker might take a stab at The Cotswold Way – 100 miles of trails leading from the historic town of Chipping Campden all the way down to Bath. Others may want to hire bicycles and race up and down the hillsides. There is a reason a staggering 38 million people visit the area each year. In fact there are many reasons; beautiful countryside, idyllic towns and villages, great shopping and lots to see and do. Why wouldn’t you go? I don’t think I’ve seen so many beautiful villages in one area. I envy that they had the foresight to protect their villages with strict planning laws. I had the feeling I had stepped back in time and it was a wonderful feeling. 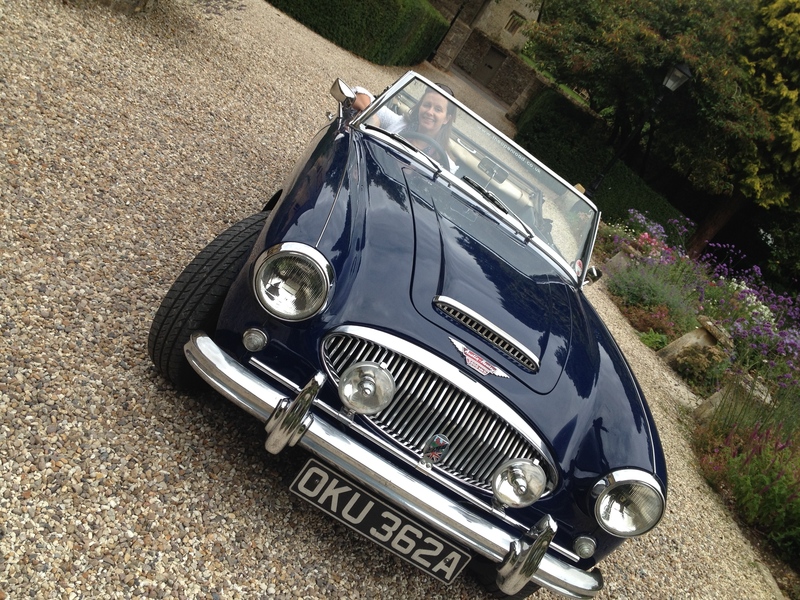 Perhaps my Austin Healey was in fact a time machine. I will make sure to book it for my next trip!